The Hunter F 1 is a rank VI British jet fighter with a battle rating of 9.0 (AB/RB/SB). It was introduced in Update 1.53 "Firestorm". The Hawker Hunter is the iconic 1950s British swept wing fighter. Produced from a requirement for a jet interceptor dating back to 1946 it fulfilled its role with outstanding success. Able to deliver a punishing blow with its four 30 mm ADEN cannons and manoeuvrability at high speed, it sits as the top tier jet for the UK. The F.1 completes the current Hawker line in the British tree after the Vampire FB.1 and Venom FB.4, providing an initial steep learning curve. Its calling card is sheer speed, with the Hunter able to go supersonic in dives once spaded. The Hunter is a 9.0 vehicle and its main strengths are high top speed and good guns, making it a good Boom & Zoomer. The Hunter is less maneuverable than the F-86 and MiG-15 while being the second fastest with a good thrust-to-weight ratio. However the rate of climb is significantly worse than the other jets and so it requires some side climbing. Stay fast at all times and never drop beneath 850 TAS (~800 km/h in air). The 30 mm ADEN cannon is an extremely powerful cannon. Being a revolver cannon, it fires extremely fast and has excellent ballistics. The Hunter F Mk.1 is, thanks to mounting a pack of four ADEN 30 mm cannons, the aircraft with the strongest burst mass, near 21 kg/s. This weapon's characteristics mean that 4 of them pose a serious threat for any aircraft that happens to be the target of them. The cannon, however, has the disadvantage of chewing very quickly through ammo thanks to its high rate of fire, so being wary of the ammo count is a necessity. The discrete tracer rounds may induce the player into error, causing the impression that only a light burst is being fired, however experience will quickly disprove anyone who thinks in this manner. The armour-piercing rounds of the Hunter enable it to do some ground attack against light and medium tanks. Easiest top jet for new players. Good guns, good speed, wings hard to rip. 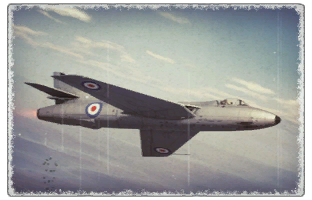 In the aftermath of the second world war the Air Ministry issued Specification E.38/46 for a swept wing research aircraft that was fulfilled by a modified Hawker Sea Hawk (P.1052). The experimental aircraft showed an jump in high speed performance and as a result Hawker went forward to modify the second P.1052 into the P.1081. With a swept tail plane and the engine exhaust now located at the rear of the fuselage instead of the split exhaust further improving performance, it attracted the RAAF. The P.1081 gave Hawker useful information for the development of the Hunter. In 1946 the Air Ministry issued Specification F.43/46 that was later added to in 1948 by Specification F.3/48. This demanded a speed of 629 mph at 45,000 ft and a high rate of climb (as F.43/46 was for a jet powered interceptor), while carrying an armament of four 20 mm or two 30 mm cannons. Using what they had learnt from the P.1052 and P.1081 they produced the Prototype P.1067. The new prototype first flew with the Avon 103 engine in 1951 with a second powered by the Avon 107 in 1952.The Air Ministry ordered the Hunter into production in 1950 with the Avon 113 power plant. Thus the iconic Hawker Hunter was born. The first production or pre-production F.1s entered service in 1953. The first was WT556 that entered service with A&AEE on the 16th of July 1953 and a further 15 delivered the same year. The Early F.1's featured boosted control surfaces but not the under belly air brake. The armament consisted of four 30 mm ADEN cannons with 150 rpg at 1200 rpm located under the nose. This page was last edited on 23 March 2019, at 16:47.